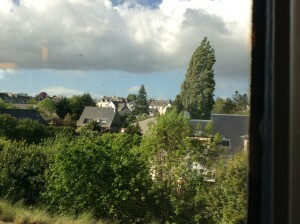 I’m on the train, traveling back to Paris through the gorgeous Breton (Brittany) countryside (green, green, hilly). It’s a cloudless day. 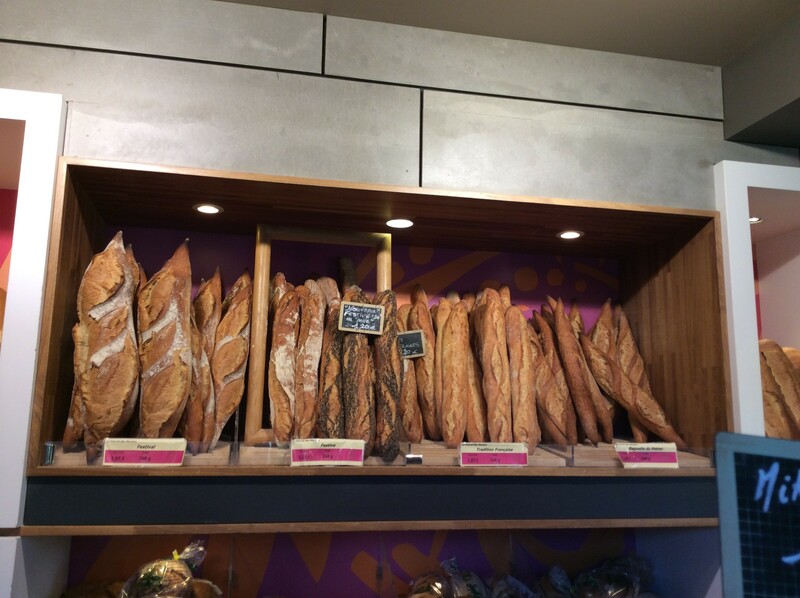 MY baguette was from the far right – ‘Pain de patron.” The little local bakery appeared on a list of the 111 best patisseries in France. Here are their eclairs. 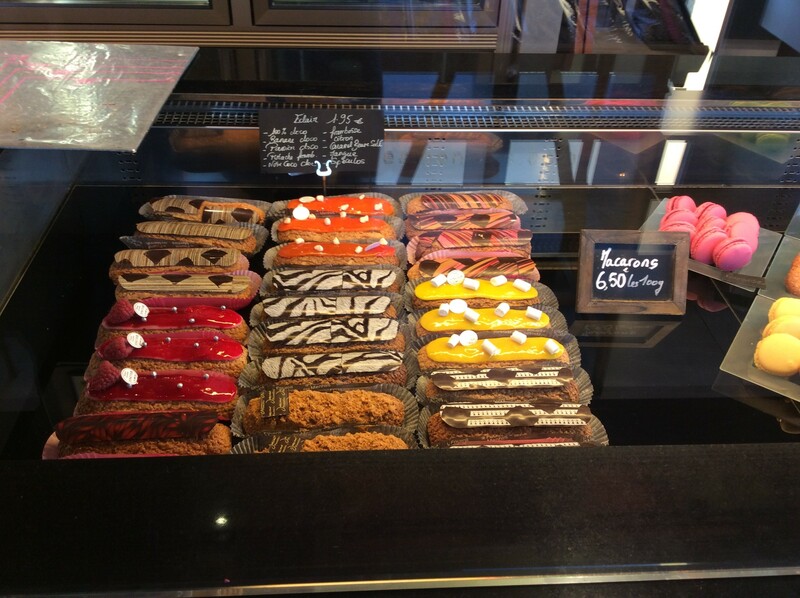 The Plomblin bakery’s eclairs. This is a town of about 4,000 – sprawling through the aid countryside. these eclairs would leave most Paris bakeries in the dust. 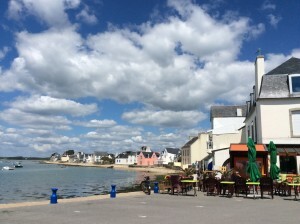 I was coming to Brittany for a week to stay with her and Marcel. 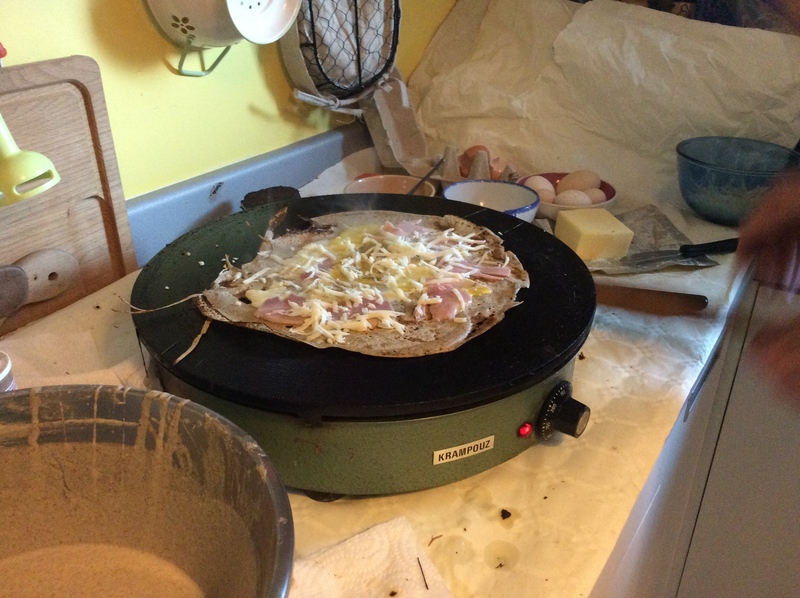 and Michel, their neighbor who makes traditional, Breton buckwheat crepes in Quimper would give me an evening lesson. It was all arranged. 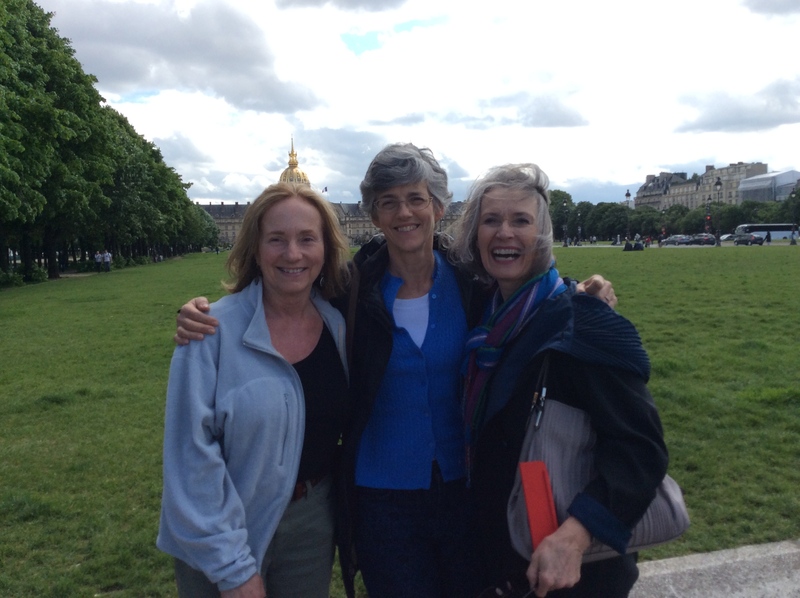 Mary Satt, Ellen and me. Napoleon’s tomb and the Dome des Invalides behind us. Didn’t seem to be any point of arguing, and it sounded great so that’s what I did. 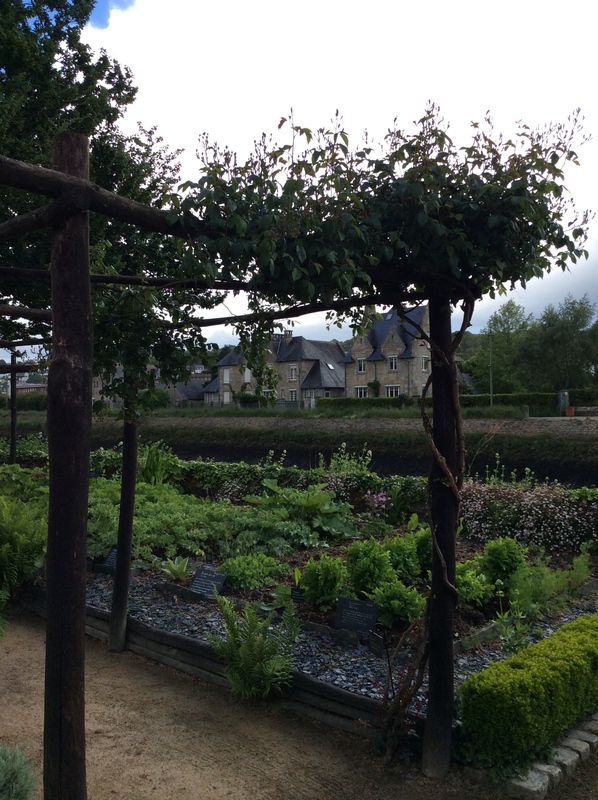 My only contribution to the plan was to ensure that my trip to cook with the hot shots in Brittany was at the END of the trip so that I could minimize humiliation by (a) my cooking, and (b) my French. Last Sunday, I headed to the Montparnasse station to catch the train to Bretagne. Two hours before that, I had put other dear high school friends onto a train to go horseback riding in some wilds I haven’t seen between Paris and Burgundy. Ellen and Mary and I had had two glorious days visiting the Rodin museum, the Paris islands, the outside of Notre Dame (too crowded), cooking a dinner here, and eating in the most wonderful restaurant so far, Stephane Martin, a brilliant young chef who’s cooking in the 15th arrondissement, 67 rue des Entrepreneurs (www.StephaneMartin.com). If you’re in Paris, bag Napoleon’s tomb – get to Stephane Martin. 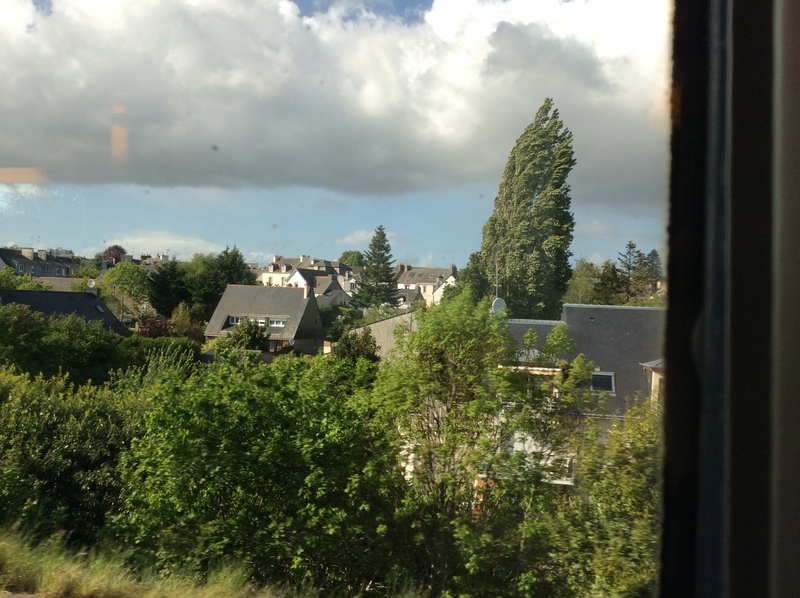 Brittany is remote – it’s a four and a half hour fast train ride from Paris to the northwest. You know about Normandy, if only because of the Normandy beaches and D-Day. 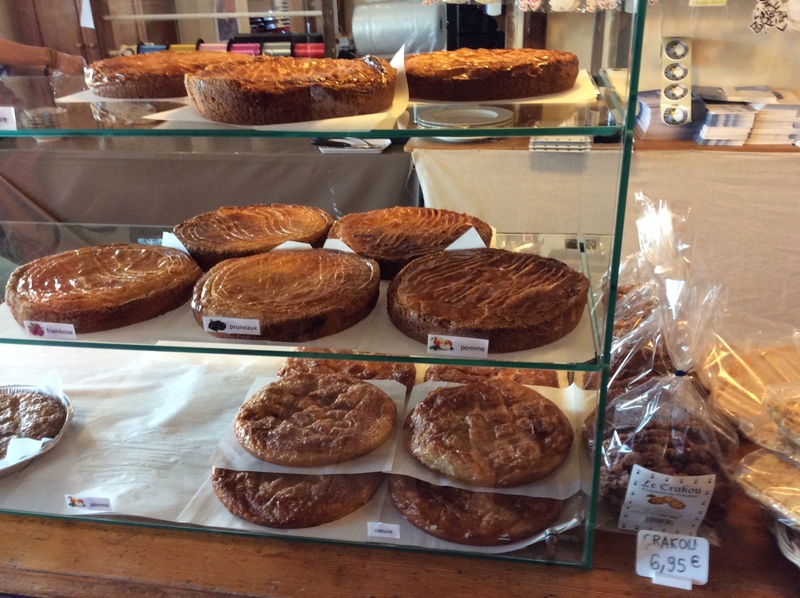 Normany is famous for cows and Camembert and apples and crème and Calvados. Brittany is famous for butter and carmel and strawberries and oysters and fishing villages and langoustines and Quimper pottery. If you’ve had salty carmel ice cream lately, or pieces of rocky salt on a carmel, it’s an import from Brittany. It took 7 hours of train riding to get there until fairly recently. It’s far, wild and charming. It’s not the Eifel Tower. It’s rural. Here’s a little fishing village 5 miles from Judy and Marcell’s house. We ate lunch there. The pink house was built for fishermen to hang out in during the winter (wholesome activities, not so much with the drinking). 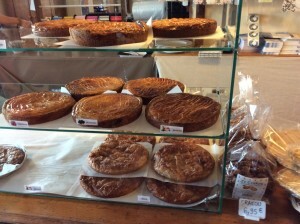 Challenge #1, The Bakery and kouign amann, on Monday morning (www.biscuiteriedequimper.com). No pictures of any of this stuff. This isn’t personal. It’s business. You can’t act like a tourist on a job. Two guys were whipping huge baking sheets of dough onto stainless steel counters with, oh horrors, an enormous picture window so the busloads of tourist clients could see exactly what I was doing. They gave me a white shirt with too-large buttons that fastened at glacial speed, and an enormous apron. 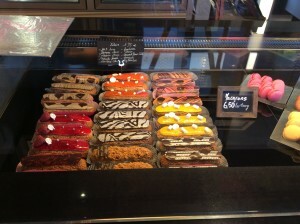 Breton butter cake (“Kuighn amman”). No action shots, but the middle row is part of the 100 left from yesterday’s baking. The head baker gestured to the table next to him, handed me a massive hunk of fragile dough, a cold square of about 3 pounds of butter and a thick, meter-long wooden rolling pin. He picked up his pin and we started, with me trying to mimic his effortless motions as closely as possible. (I felt exactly like that time I decided to start ballet in law school. The teacher had been a principal dancer with the NYC Ballet, under Ballanchine. I was awed, and behind the curve.) I tapped the top of the dough, tapped the bottom, stretched out flaps on the sides, folded them in, rolled the whole deal out to a meter and a half, and a meter wide, maybe, then folded it like a letter, flicked on flour. (At least I can do the folding and the flour flipping well – that’s one of the deals that separates les professionels from les amateurs, I’m here to tell you.) But the real breaking point hits at stage #4. You roll out the now 750+ layers of dough and butter and sugar to two meters long and a meter wide (3+ feet x 6+ feet). I could barely reach the back of the stainless steel table, but did it without ”dechire”ing (tearing) the dough. That was a miracle. A hole in the dough would have been “une catastrophe.” We did it – went through the whole six step process four times and then he gave me a taste of a finished one. as I struggled to UNDO the buttons quickly, which were still larger than the holes. The kouign amann was staggeringly good, if you like crispy pastry, butter and crispy carmelized sugar. I do. It was a Meg Ryan/Billy Crystal-in-the-diner moment, I’m here to tell you. But I was in France. I was trying not to act like an amateur, so I was subtle and didn’t embarrass anyone. When we do the closest approximation of kouign amann of which I’m capable at our house in MN, I’m thinking some of you may not be capable of pulling off my sophisticated restraint. I’m putting $5 on Karen who-shall-remain-last–nameless moaning and pounding on the table. This is the Priory – view from the medieval herb garden. Challenge #2, Le Priore (the Priory), Tuesday all day: It’s a gorgeous place – the12th century priory (de-priory-ized during the French revolution – a bad time for the church in France – then used as a military depot, then restored during the late 19th century, then further restored and used as the loveliest restaurant in Quimper fairly recently. The last party Judy arranged there was for the American Ambassador and visiting dignitaries. Restaurants are usually closed on Monday, so Tuesday is really the first day of the work week for them. Fish arrive, they make stocks from langoustine shells, they organize and get things underway for the week on Tuesdays. 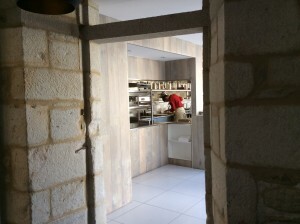 Judy and I went in through the back door of Le Prieure (www.le-prieure.fr) . It was more disconcerting than walking in the front. The sous-chef (the chef in charge of the kitchen, the #2 guy, not the planning/oversight chef), smiled reassuringly at my mommy surrogate, gently pried my hand from her arm, showed me the locker room where I could stash my raincoat and pink My Little Pony lunch box (okay, I’m getting hyperbolic here), didn’t introduce me to the other kids, but did give me an apron to wear over my plain black clothes, handed me a knife and something like 150 of the biggest, most gorgeous langoustines I’d ever seen. They were alive, iced, and thank heavens I, child of Ohio, knew all about twisting off their little torsos from their tails. I got to it. I murdered all of them. I know I’m going to come back as a grasshopper in my next life. Or a langoustine. The young guy next to me (Christophe) showed me how they wanted them shelled. You pinch the shells together on the back (“tack, tack”), then delicately pull off each shell segment except the last two and the tail. Okay, I could do that. The shells poke your hands, but I’m fast. And Christophe, a sweetheart, kept handing me spoons of things to taste – fish tartare with lime, smoked Norwegian salmon. Total sweetheart. The only photo I took, as I was leaving – here’s Christophe. If he’d been plating, his head would have been 12″ lower. All this time, waiters and the chef de cuisine and other kitchen help arrived, held out their hands to shake (I offered a wrist, not wanting to slime them with my gooey, seafooded hands. They murmured “bonjour,” shook my wrist, kissed me on both cheeks, then told me their names. I smiled, said, “Marte,” and continued shelling crustaceans, which I lined up in military precision in a big metal pan. Other than the one female langoustine with a HUGE roe sack that disintegrated between my fingers, it went well. I pointed my humiliating failure out to the sous chef when he came by (there was no checking to see that I was doing things well – they just told me what to do and disappeared), he said, “pas de probreme,” and chucked it in with the others. I said, “Pas de problem ? C’etait une catastrophe !” He laughed and bolted. I finished. 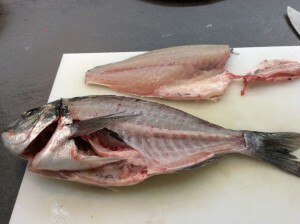 I filleted this with six cuts per side. I’m proud. I don’t need to hang my head in shame before the numerous fisherpeople of Minnesota. He waved me toward a pile of dorade (lovely, medium sized fish – “dolphins” in English, but not the mammals). A huge pile of dorade, something like 60 of them and asked me whether I wanted to fillet them. Now the secret is that I CAN fillet dorade. I learned how here, since Russ does the fish in our family. The first time I filleted a fish at L’Ecole Alain Ducasse, the chef inquired politely if I were making tartare. But by the third one, I had nailed it. So the chef and I tackled the dorade. We fell into a rhythm. He filled them, I deboned them with lightening speed. You do it by feel. We whipped through the enormous piles of dorade, then I finished and did everything on the huge, slithery cod fish, but only 3 of those. Then I washed two huge sacks of mussels – 5 kilos/11 pounds each – and we had lunch before the service. The cooks and the waiters were all kids in their 20s, except for the chef. Christophe and I had progressed from “vous” to “tu” (I was thrilled that he wasn’t calling me “madam,” but was telling me what to do as if I could do it. Otherwise, no one had talked with me all morning (except for (“pardon,” “chaud” [hot], nods and all the kissing), so I’d kept my head down, smiled occasionally and worked. Lunch was simple and absolutely delicious – zucchini and the loveliest roast chicken you’ve ever tasted. I asked later – Christophe had made it. Here’s the recipe. (1) get a bunch of French chicken legs and thighs (unseparated). Put on onion, salt, pepper, olive oil, garlic and un petit peu de beurre (“a little bit of butter,” and you have to say that with a French accent or it doesn’t brown correctly). You probably brown it first in the butter, then put it in the oven at 180 degrees (about 370 F) for about 30 minutes. It has to be a French chicken, which are more chickeny than ours, as Julia Child says. Nobody talked to me, so I just smiled, ate quickly and we all raced back to work. They were now ready for the lunch service – show time. I gave serious thought to hanging myself up on a corner hook by my apron strings to be out of the way. It was like being backstage in a play opening night without having attended rehearsals. No quiet corner appeared. The sous chef gestured to me as he started to unstop the huge sink. French sinks don’t have drain baskets – anything thrown into them either plugs up the drain, or is stopped by four little crossbars and plugs up the sink. Six gallons of scaly, scary gray water shimmered in that sink. The cooking chef fished his hand down to find the drain and told me he’d explain what he wanted me to do as soon as he fixed this. “Chef, go away and cook. I’m highly skilled in the exact technique for doing this.” Turned out I’d just flipped the magic switch. Ten minutes of fishing fish scales and guts out of opaque liquid with bare hands and I was part of the team. A slightly moody young cook ran past, shifted the trash can to right next to me and grinned. I helped people do things, then I got to make 80 cheese-and-leek filled chou pastry hors d’oeuvres with tiny pastry hats. Fairly snappy pastry bag and balancing work. And at 2:00 everyone left until 6:00. The executive chef had left it up in the air as to how long I was supposed to stay. They asked if I wanted to come back after lunch. Score! I asked if they needed me, because I really didn’t want to be in the way of “le service” [the dinner service], and they said, no, I would be useful. Yes! Invisible high five. Quimper – the beautiful medieval center of town. I walked around Quimper for four hours. 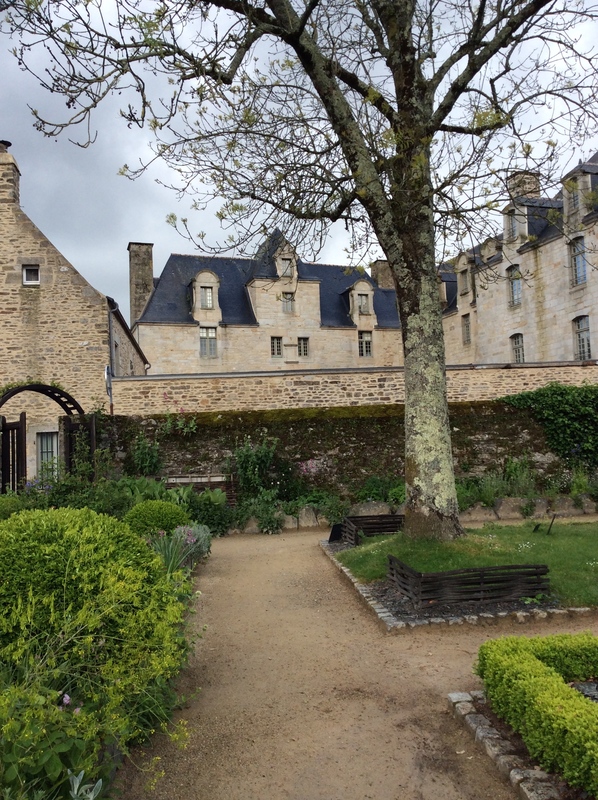 I explored the medieval town, bought some macarons from the pastry shop of a MOF (the best artisan in France award). It’s part of my education to taste things. I walked by the river. I walked up hills. 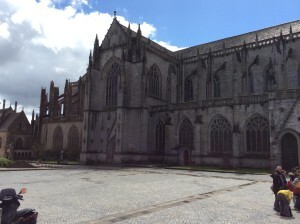 Quimper cathedral – built over 400 years. The chancel shifts to the left – it’s very curious. 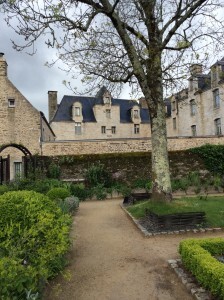 I sat in the cathedral for a while, strolled through the medievally-inspired Priory garden behind the restaurant, across from the Quimper faience museum (very fun), then went back to work. It was great. We prepared a huge buffet for 50 – millions of hors d’ouvres that Christophe and I arranged on platters, I stuffed puff pastry vol-au-vents with mushroom duxelles, toped them with an elegant triangle of foie gras, heated them and garnished with cilantro. I spun into the rushing dance down the narrow spaces between tables, carrying stuff back and forth from the specific places in the huge walk-in refrigerator room. I covered platters with film (plastic wrap. FRENCH plastic wrap that has no cutter strip on the box, you have to find a knife and try not to tangle it. It’s easier to bone the fish. But they let me onto the team, and I watched and when things calmed down, asked questions and helped different people and suggested platter arrangements. They can really, really cook. I learned ways to plate sausages decoratively, how to cook riz de veau (veal brain and it’s actually amazingly good). You cook it just like sole meuniere – brown it, then tilt the frying pan over a roaring flame and flip spoonsful of boiling butter over it. I earned an “impeccable” from Christophe, over a plating suggestions to keep the darned chou pastry appetizers from rolling all over the place. That may be the height of my career. He’s young, but the guy does the most gorgeous plating you’ve ever seen. He should teach when he’s older – he’s gifted. I also hope he started standing up straight when he’s working rather than leaning over nearly double. His 50 year old back would thank him. They started making jokes with me. The young riz de veau guy who cooks well and moved the trash can for me (probably is the one who plugged up the sink), rushed over to me, grinning, as I shelled 20 pounds of cooked mussels – held up a beautiful, white-tipped, elongated French radish (pronounced, “rad-ee”) and said, “Marte, are you rad-ee? ?” It was a joke! Mikey likes it! Christophe created a particularly beautiful plate. I ventured my first English, grinning, “Nice!” They asked what it meant. I made the French sideways hand shake as if you’re flicking water off the ends of your fingers (it’s along the lines of, “wow, will you take a load of that – pretty snappy.”) So “nice” became the big word of the evening when anyone had a moment to talk. We worked on high fives before I went home that night. Someone probably told them to be nice to their visiting aunt that morning. They did it. Then they let me into the family. 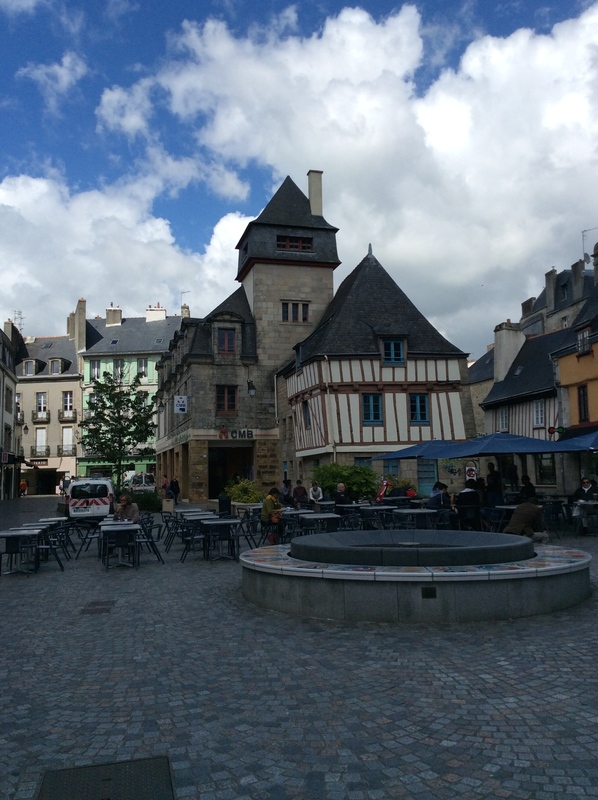 So if you’re ever in Quimper. THAT’s the place to go for an exquisite meal. Le Priore. Making a crepe (a “galette,” the Breton name), made entirely with buckwheat. See how thin it is? This one has ham and egg. 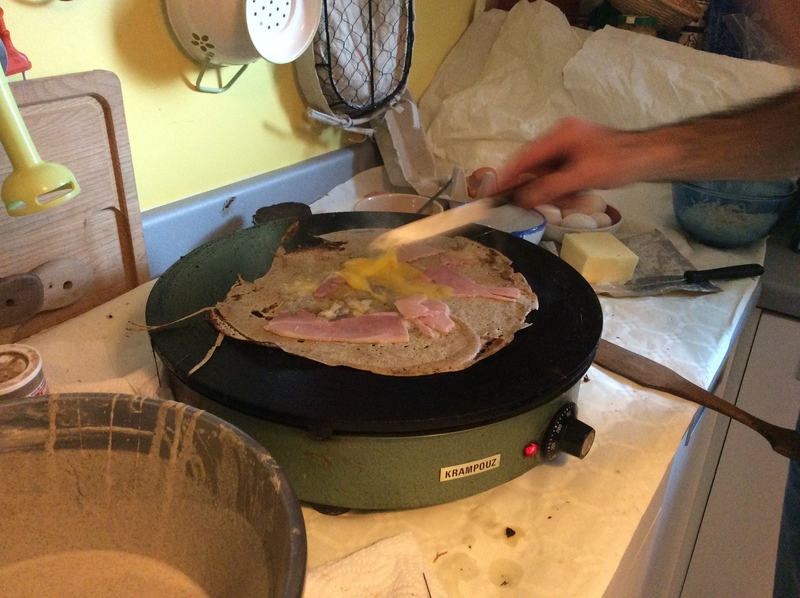 Challenge #3: the Great Breton Crepe Evening Wednesday. It was GREAT. Michel learned tho make crepes from his grandparents. His grandfather made his wooden spatula for him. You’ll see the pictures – what you can’t see is that these are the best crepes in the world. They’re way better than the Parisian ones made with white flour. These are buckwheat. I had them in Lyon last year and that one was no where NEAR as good as Michel’s. I’ve talked too long, so I’ll summarize and you look at the pictures. 1. You mix the batter by hand for a long time. I mean WITH your hand, not a spoon. It’s a little like splashing in mud, but loads of aeration. 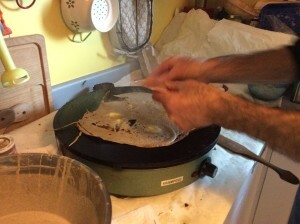 It takes a while – 3 eggs into a well of 500 grams of buckwheat flour, then add trickles of liquid. He eventually incorporated not quite a quart of milk (less than a liter bottle), 2 teaspoons of fleur de sel (that’s really approximate – it was bits in the hand 4 times), and maybe ½ – ¾ cup of water. You sweep tiny bits of flour from the edges of the egg mixture so that you don’t get lumps, then pull up streams of batter 18″ over the surface and let it cascade back into the bowl to aerate it. Then you cook them over a 240 degree centigrade (455 degrees Farenheit) griddle. The test one (enough salt? Thin enough batter to have little holes through which you can see the griddle?) is “pour le chat.” [for the cat]. Just like pancakes. 2. They cook quite quickly (a minute and a half to two minutes or so if it’s just plain – this doesn’t count cooking fillings). You can eat them (“nature,” or naturally – strawberries without cream or sugar – just plain, are “nature”), but in Brittany, “nature” means with butter spread on the non-presentation side, which is how they get really crispy. The more butter, the crispier. I limited myself to about 2 teaspoons of butter on my nature crepe. Others are not so restrained. In more modern times, people have started adding other things. A “complet” has ham and egg and gruyere-type cheese. You can have the egg sort of scrambled, or sunny side up, and it’s cooked right on the lower side of the crepe. With ham and cheese. This was mine. 3. Everyone eats exactly what they want. Immediately. You don’t wait, you just get your crepe, run to the table and expire with the exquisiteness of it all. 4. Meal crepes first, then dessert crepes. You could do sautéed apples with salty carmel sauce, chocolate sauce, ice cream inside, whatever. 5. The tricky part is spreading the batter. There’s a little flat paddle and people who know what they’re doing spread it very thinly – with little holes where the griddle shows throough – it is crispier that way. But the trick is only pulling the batter. The REAL trick I discovered after doing a few is to put the batter on the griddle off center. 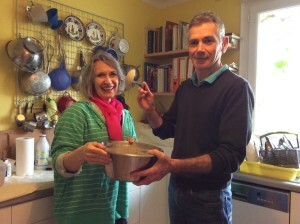 I’m right handed – I ladled on the one ladle-full of batter onto the upper left part of the griddle with my left hand. Then I swooped the paddle to the right and down in a half-circle, then I swooped the paddle to the left and down. Then you fix the holes. This is at high speed, because the thing is setting up and hardening as milliseconds pass. Judy and I went to the wood guy at the market yesterday (Thursday) and I bought the turner and batter spreader. 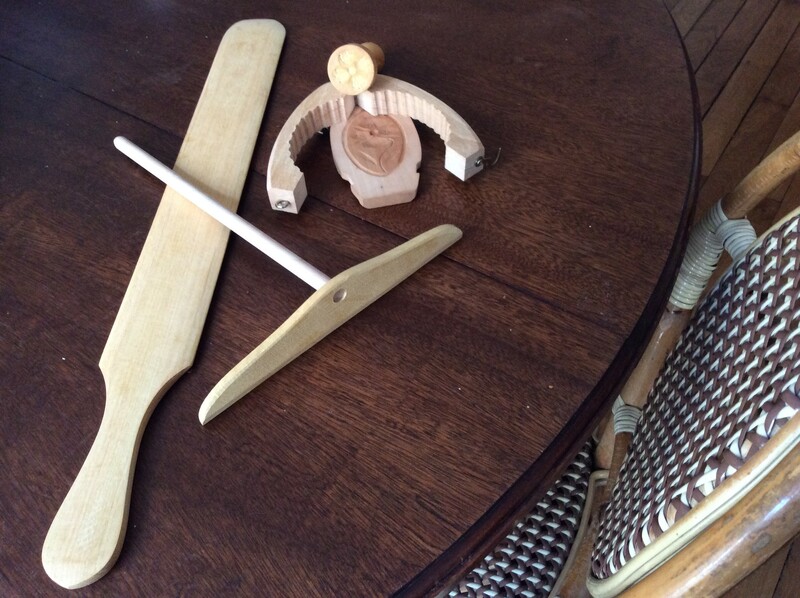 I fell in love with hand-carved wooden butter molds, so I got one of them, and two butter stamps. We are going to have fun parties when I get home! 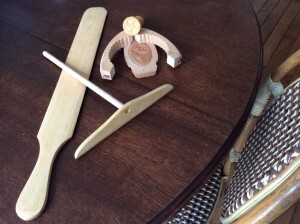 The galette instruments are made of boxwood, like the pegs of daughter Elizabeth’s violin. I think that’s a good omen. I’ll be practicing. Michel was playing the Mendelsson concerto with the ones his grandfather made for him. Judy and Marcel – thank you more than I can express! This entry was posted in Cooking, Cooking and tagged apprentice, Bretagne, Breton, Brittany, cooking in France, French cooking lessons, galettes, kouig amann, Le Priore, Quimper, Quimper faience, Quimper pottery, stagiere on June 2, 2014 by Martha Grace Reese.